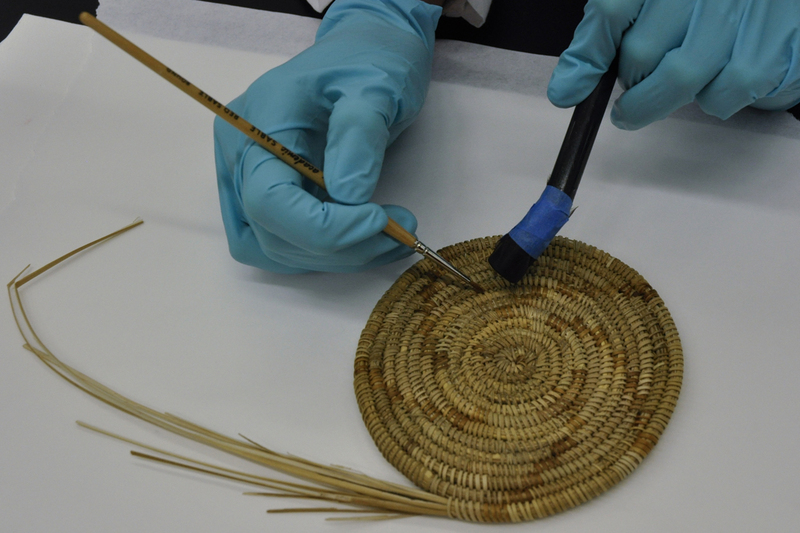 As part of our class “Conservation and Ethnography”, each student worked on an object from the Agua Caliente Cultural Museum (Palm Springs, CA). 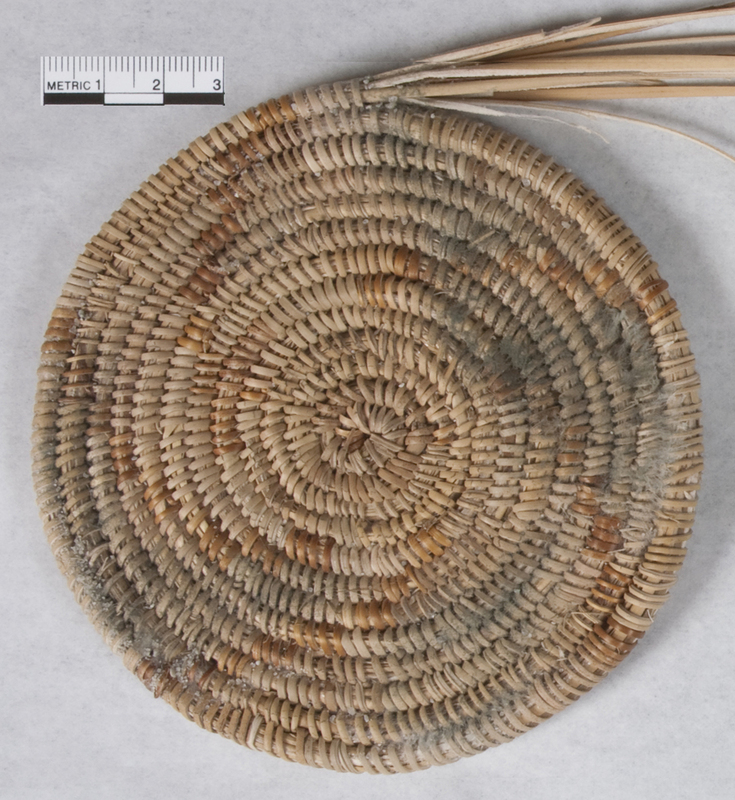 I worked on a Kumeyaay coiled basketry start owned by a private collector in Palm Springs that had mold growing on both sides of the object. The Kumeyaay are located at what is now the border between the United States and Mexico, along the Pacific coast. This coiled start has thirteen coils and the beginnings of a spiral pattern, all made out of juncus. The five-part spiral pattern was created through the introduction of the red portion of the juncus stems. Mold developed on the object due to a combination of a source of moisture and cycles in temperature. Molds can damage the surface and structure of individual objects and can spread from object to object within a collection. Therefore, this object was treated to remove the mold in order to prevent further damage to the object as well as to prevent the mold from spreading. The mold was located on both the front and back surface of the object affecting both the epidermis and the cuticle of the fiber and possibly causing darkening of cracks. The presence of mold on both sides of the object suggests that it was also present within the object itself. The mold covered approximately one third to one half of each of the object’s faces. The treatment of the object began with preventive conservation measures. The basket start was placed on a tray in two polyethylene bags with a desiccant. The tray was designed to be somewhat rigid to prevent any mechanical damage to the brittle plant material during handling while in cold storage. The silica gel desiccant was placed in polyethylene bags with cheese-cloth windows. The object was then placed in the freezer to prevent new mold growth. The removal of moisture from the object and the reduction of temperature prevented the continued growth of the mold. Once the moisture from the mold was removed and the mold could be brushed without smearing, it was removed by vacuuming with a high efficiency particulate air (HEPA) vacuum. The nozzle of the vacuum was covered with a fine mesh cloth to prevent any loose fragments of the basket from being vacuumed up. A brush was used to dislodge the mold and guide it to the vacuum nozzle. During treatment, to protect against the mold spreading, surfaces were covered with tissue paper. When possible treatment occurred within a fume hood or with a fume extractor nearby, while also wearing goggles, a respirator with a particulate filter, gloves and a lab coat. At the end of each day, the tissue paper was folded up and disposed. 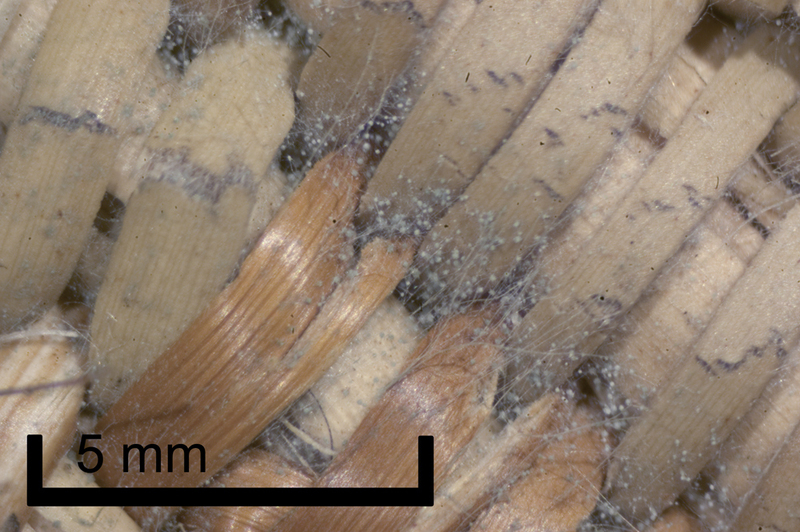 The tools were cleaned and the area wiped down with ethanol with 20% water (Florian, 2000, Guild and MacDonald, 2004:20-21). In order to fully clean the object and reduce the chance that the mold would begin to grow again on the object, the object was cleaned with ethanol with 20% water on a suction table (alt. solvent trap or suction disk). The suction table treatment was chose because it would pull the ethanol solution through the object, guaranteeing that the solution would penetrate the interior of the object and kill any mold present within. Suction tables are like flat vacuums and exert suction on the materials placed on them. 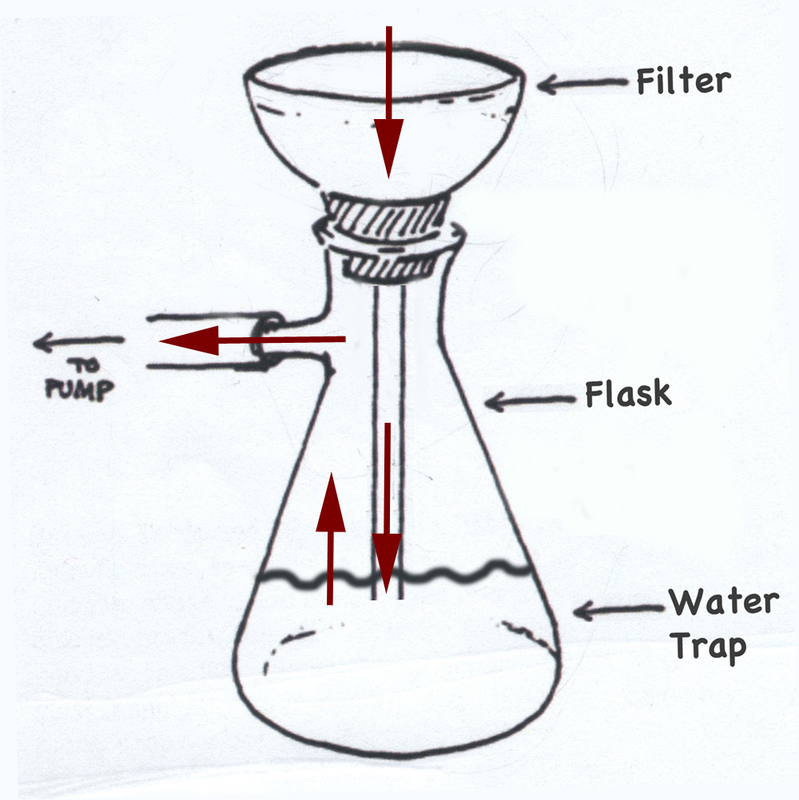 The vacuum creates a pull in the Erlenmeyer flask, which pulls at the air through the filter. The water in the flask traps the mold and prevents it from entering the vacuum. The filter paper helps to pull the solvent down and away from the object (Hackney and Fairbrass, 1980, Michalski, 1984, Varga, 2007, Vitale, 1988, Weidner, 1984). 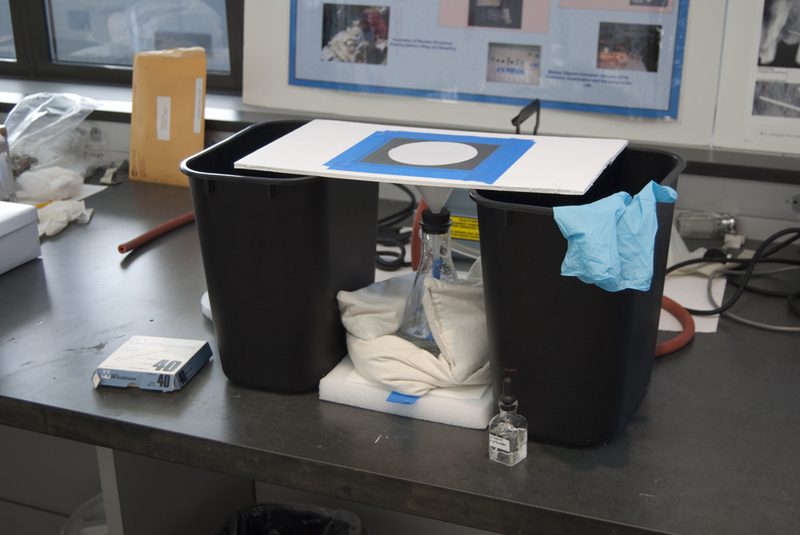 The suction table created for this treatment had a perforated metal sheet over the funnel opening to provide support to the object and filter paper while still permitting air to pass through (Katz, 1999). The manufacturer of the Cast-N-Vac pump (vacuum pressure: 26 Hg) used for this suction table was contacted and to confirm that ethanol could be used safely with the machine. Before applying any solution to the object, spot tests were carried out to ensure that it would not adversely affect the object. Then, the object was placed on the suction table and the ethanol with 20% water solution was applied by pipette to the area over the opening in the table. Enough solvent was applied to pass through the object and appear on the filter paper below. After the vacuum had had a chance to pull most of the solvent through, the object was moved so that another section was over the suction opening and the process began again. 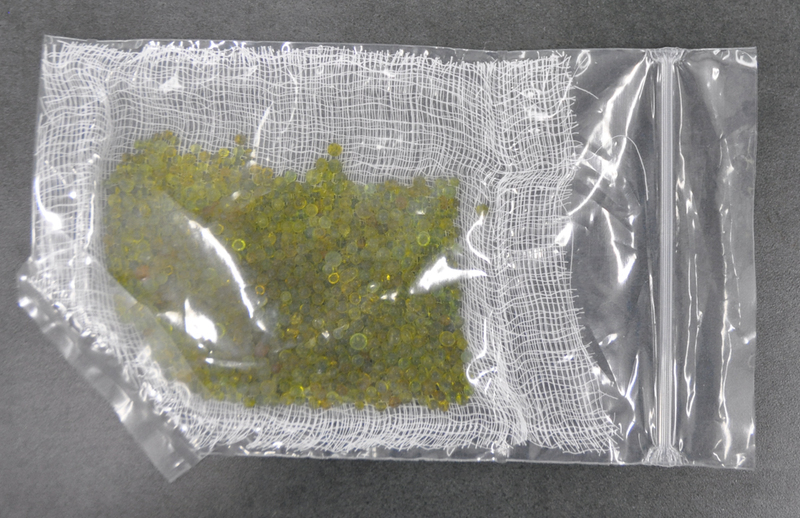 Following treatment, the object was placed in a bag with several packets of a desiccant. The packets of desiccant were refreshed when they changed color, indicating they had reached saturation. The removal of the moisture introduced during treatment was important to prevent the growth of any new or remaining mold spores on the object. Several days after treatment, the object was examined under a microscope to look for any remaining mold spores. None were found and therefore it seems likely that the suction table treatment removed the mold. Additionally, the filter papers used to test and conduct the suction table treatment were photographed in normal and UV light. 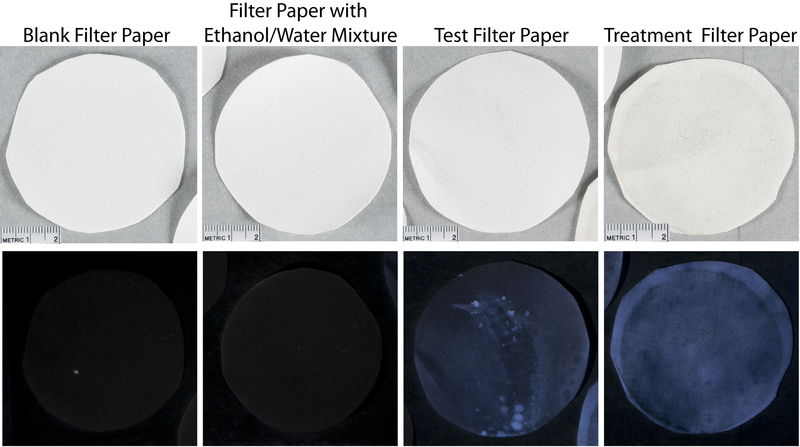 These were then compared with an unused blank filter paper and a filter paper that had had the ethanol and water mixture applied to it. The test and treatment filter papers fluoresce and the unused filter papers do not. This suggests that something was removed during the treatment. You can also see that the treatment filter paper is slightly yellowed. This may indicate that some components of the plant materials may have been solubilized by the ethanol-water solution and transferred to the filter paper or the fluorescing material could be related to the mold. The most effective and efficient method of mold prevention is maintaining good climate conditions. For mold prevention, this means keeping the relative humidity below 65%. For storage collections, increasing air circulation can also help to reduce mold growth by ensuring that no localized areas of high relative humidity develop. For this object, a box was made to facilitate the maintenance of a dry microclimate and prevent future outbreaks of mold. The silica gel used in this treatment maintains a very low relative humidity. It can be refreshed by removing the silica gel from the bag and placing it in the oven until it turns orange. It can then be cooled and placed back inside the packet. Florian, MLE. 2000. Aseptic technique: a goal to strive for in collection recovery of moldy archival materials and artifacts. Journal of the American Institute for Conservation 38 (1):107-15. Guild, S, and M MacDonald. 2004. 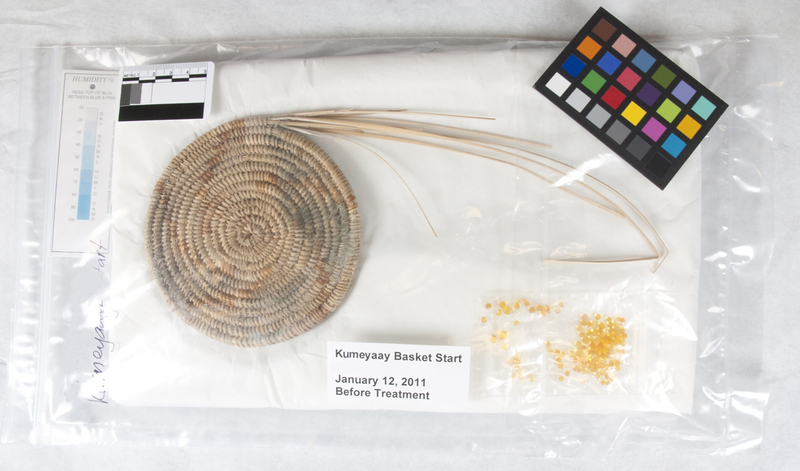 Mould Prevention and Collection Recovery: Guidelines for Heritage Collections. Vol. 26, Technical Bulletin. Ottawa: Canadian Conservation Institute. Hackney, S, and S Fairbrass. 1980. A High Vacuum Suction System for the Removal of Stains on Paper. The Conservator 4:1-4. Katz, K. 1999. An Inexpensive Mini-Suction Table. AIC Paintings Specialty Group Postprints, edited by F. Wallace. American Institute for Conservation 27th Annual Meeting, St. Louis, Missouri. Washington, D.C.: AIC. 85. Stiber, Linda and Elissa O’Loughlin. 1992. Hinge, Tape and Adhesive Removal. Chap. 15 in Paper Conservation Catalog. Washington D.C.: American Institute for Conservation Book and Paper Group. www.conservation-wiki.com/index.php?title=BP_Chapter_15_-_Hinge,_Tape_and_Adhesive_Removal (accessed 03/15/2011). Vitale, T. 1988. Observations on the Theory, Use and Fabrication of the Fritted Glass Bead, Small Suction Disk Device. The Paper Conservator 12:47-67. Weidner, Marilyn. 1984. The Suction Table: Ten Year Review of its Development. AIC Preprints. American Institute for Conservation of Historic and Artistic Works Preprints of the 12th annual meeting, Los Angeles, California. Washington, D.C.: AIC. 94-101. 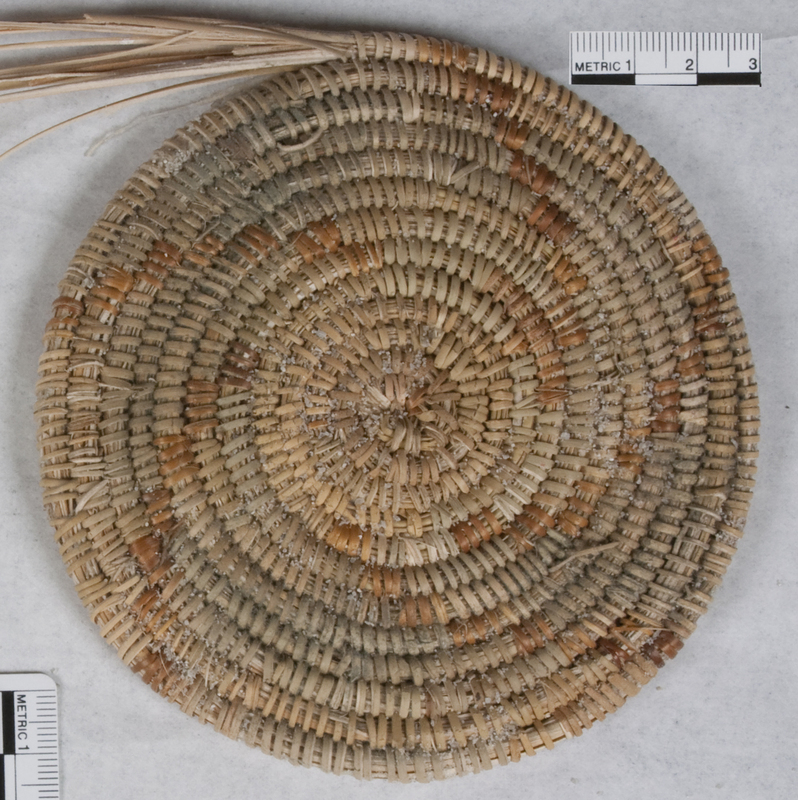 Categories: Conservation and Ethnography, Courses | Tags: basket start, juncus, Kumeyaay, mold | Permalink. Tessa de Alarcon will be working on finds from the site of El Zotz at the lab in Antigua, Guatemala. She is then off to spend the remaining 9 months at the University of Pennsylvania Museum of Archaeology and Anthropology. 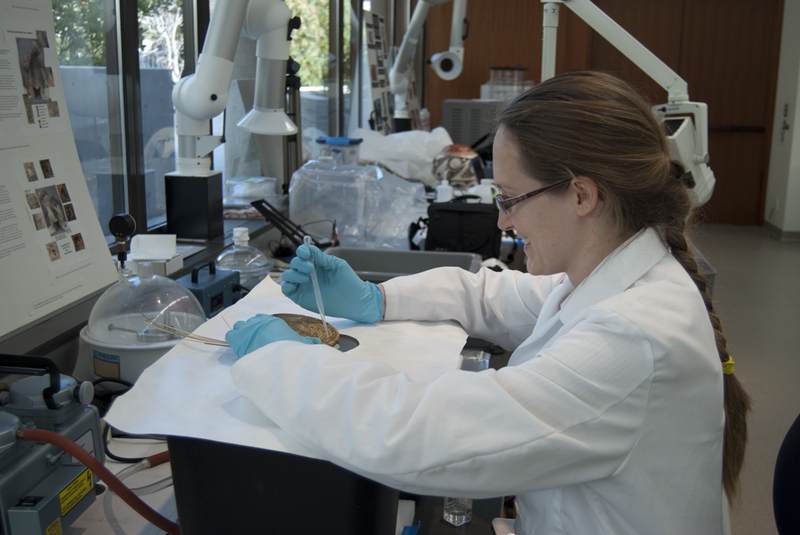 Lily Doan will first head off to work in the conservation lab of the Gordion Archaeology Project and then come back to LA to work in the Objects Conservation Lab of the Los Angeles County Museum of Art. Elizabeth Drolet will also be heading to Turkey but will head south to the Tell Tayinat Archaeological Project followed by an internship at the Metropolitan Museum of Art. Dawn Lohnas will spend the summer in Greece working on the Mt. Lykaion Excavation and Survey Project and then come back to LA to work in the Antiquities Conservation Dept. at the Getty Museum. Nicole Ledoux will spend the year at the American Museum of Natural History. Robin OHern will be doing a lot of traveling this coming year with 3 internship placements in 3 different countries. First she’ll spend the summer conserving finds from the excavations at the Athenian Agora. She then heads to Oxford to work at the Pitt Rivers Museum,after which she comes back state-side to work at the Corning Museum of Glass. Cindy Lee Scott will spend the summer working on the Haiti Cultural Recovery Project and then will head back west to work at the Museums of New Mexico. The UCLA/Getty Program extends thanks to the NEH Preservation and Access Education and Training Grants, and to the Samuel H. Kress Foundation, for internship support. We wish our students every success in their internships and can’t wait to hear about all their exciting work when they get back next June! Categories: 3rd Year, Internships | Permalink.